Representation theory is a deep and beautiful subject. Our goal in this chapter is to develop those concepts and results that we need for applications to Fourier analysis on compact groups and hence to probability theory. 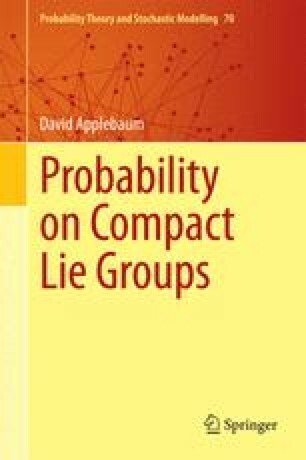 In the first part, we give a self-contained account of key aspects of the representation theory of compact groups, including proofs of Schur’s lemma, the Schur orthogonality relations and the Peter-Weyl theorem. We also introduce the Fourier transform for suitable functions on the group and establish some of its elementary properties. In the second part of the chapter, we introduce weights and roots and sketch proofs of the Weyl character and Weyl dimension formulae. This part is far less rigorous and many proofs are omitted. The key point that readers need to absorb is that irreducible representations are in one-to-one correspondence with highest weights and, as we will see in later chapters, this enables us to carry out a finer analysis of functions and measures in “Fourier space”. Finally we illustrate the abstract theory by finding all the irreducible representations of \(SU(2)\). (We use a lot of elementary Hilbert space ideas in this chapter. Readers requiring a reminder of key concepts should consult a standard text such as Debnath and Mikusinski  or Reed and Simon ).